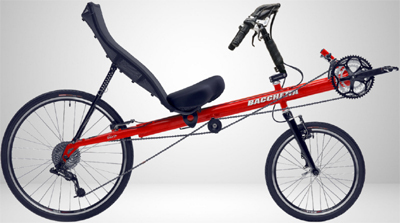 The Bacchetta Carbon Basso brings all of Bacchetta’s go-fast design to a frame suited for shorter riders. Also availed in an upgradable GS version. 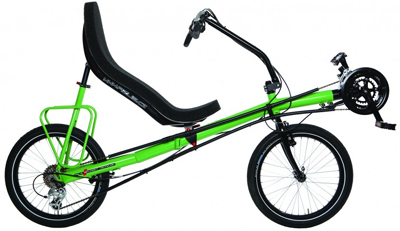 If you are a shorter rider looking for a fast recumbent bike, your choices lie with the Lightning P-38 or the Carbon Basso. This develops the Giro 20 form into an uncompromising racing frame in carbon. The full-on Carbon Basso uses top end racing parts, a carbon fork and a carbon seat. Bacchetta released this model in 2016 and we are not actually familiar with it. We’ve handled a few Carbon Aero models and we expect similarities, but we can’t honestly speak about the Basso. However, we love seeing this model return to Bacchetta’s line up. Pretty much everyone who works here is short and we appreciate it when a supplier addresses our needs! 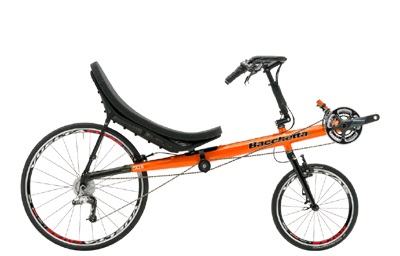 If you are easing slowly into the performance bike thing, Bacchetta also offers the Basso GS. “GS” stands for “Giro Spec.” This gives you the carbon frame and fork carrying a mix of the Giro 20 and Giro A20 spec, with a bike of the Corsa tossed in. It comes with the Euromesh seat. Out price (subject to change): $4200 for the Carbon Basso. $3200 for the Carbon Basso GS. The Bacchetta Carbon Basso 2.0 is a revamp of our classic Ti Aero Basso. The Carbon Basso is designed for shorter riders or for those looking for a performance bike with a slightly less aggressive BB to seat ratio. But keep in mind that the new Carbon Basso frame comes out of the same mold as the CA2… so there is no need to question it’s performance capabilities, that’s built into the bikes DNA. Also, unlike the Ti-Basso, which only came in a small size, the Aero Basso is available in a large frame size too! Basso Frame Kits start at $1700. Frame Bacchetta Custom Carbon 2.0 The same ovalized cross section as other Bacchettas. The seat mounting on the carbon frame is much more finicky. 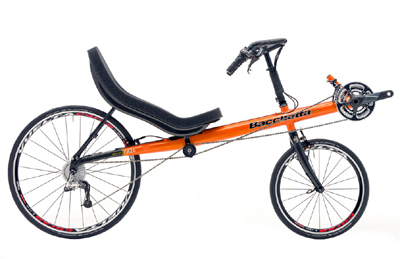 Fork Bacchetta Full Carbon 20", w/disc, V-brake and road caliper options This fork has it all. Seat Basso: Carbon w/Bacchetta Seat Stay Clamps A carbon shell with a cushion top of it. Handlebar Bacchetta Aero Tweener Bars (300mm reach) an open cockpit style handlebar designed for comfort and aerodynamics on long highway rides. These bars are more narrow than what comes on the Giro, for aerodynamics. We can retrofit wider bars if needed. Stem Bacchetta 3-Piece Adjustable A rigid riser with no fore/aft adjustment. This gives a more solid feel and saves weight. Reach can be adjusted by switching parts or retrofitting a B-pivot riser. Rear Derailer Basso: SRAM X0 9 Speed One of the best 9-speed rotational shifter you can find, well suited for long cable runs. Front Derail Microshift R439 SS A brand you've never heard of, but a good quality, long lasting front derailer. Shifters Basso: SRAM X0 9 Speed The best 9-speed rotational shifter you can find. Crankset Basso: FSA Hollow Carbon 52/39/30T A road bike triple crank geared for speed, using a modern, lightweight style of bottom bracket. Cassette SRAM PG970, 11-32, 9 Speed A wide range, good quality freehub cassette. Front Brake X-Eyed CNC Dual Pivot Road This is a really good road bike style brake. It is lightweight. It is as powerful as many mountain bike brakes. Best of all it has flexible cable routing options. 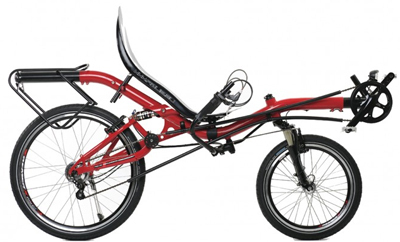 If your recumbent uses a road bike front brake and limited steering because of it, consider this brake as an upgrade. Rear Brake X-Eyed CNC Dual Pivot Road This is the same brake as the front, but with a shorter mounting post. Front Wheel Vuelta Corsa Lite (Options of 451 or 406 Front Wheel Sizes) 451 and 406 are two distinct wheel sizes. Obnoxiously, both are called "20 inch." You will find a wider choice of tires and tubes in 406, but 451 is marginally larger in diameter. Front Tire Schwalbe Durano 28c A 406-28 or 451-28 narrow road slick, depending on wheel choice. This is a long wearing training tire. Rear Tire Schwalbe Durano 28c A 622-28 narrow road slick. Chain KMC X9 Better quality 9-speed chain. Pedals Wellgo LU897 Platform Nothing great here, but bikes like this usually don't even come with pedals. They assume you'll be supplying your own preference. These pedals will get you going, but you'll want to upgrade. BB Height 26" A moderate elevation to the crankset relative to the seat height. Seat Height 22" Seat height actually changes as the seat is moved on the frame for leg length adjustment. Ironically it gets higher up the shorter you are. We'd reckon seat heights range from 21 - 23" The seat mount on the carbon frames fits all Bacchetta seats, but mounts the seat lower. Wheelbase Standard: 49" Wheelbase on the large frame is about 51". This is the distance between the wheel hubs. Gear Range 25-126.5" Geared for speed. If you need lower gears they can be easily arranged. Frame Size Standard: 12.5" Boom, Large: 14" boom This is not a very important metric. But if you are trying to determine what size frame you have then this is the easiest to measure. The "boom" is the part of the frame that runs from the headset (steering axis) out to the crankset. Measure from the middle of the head tube to the middle of the bottom bracket shell. X Seam Standard: 37"-46", Large: 41"-50" See our guide on how to measure your ex-seam.